In a digital world where many of us are permanently attached to our gadgets and smartphones, the digital arena is an obvious choice from which brands to promote themselves. Yet face to face events and experiential marketing still exist and remain supremely successful. As human beings we are social creatures and the event sphere allows us a chance to communicate with one another (H2H); to discuss and share our thoughts and ideas whilst interacting with the brands and businesses that interest us. By visiting a brand’s exhibition stand we form our own opinions of a service or product. We get to feel, touch and engage one on one with brand ambassadors and it’s these actions that forge stronger brand connections as a result. The VR industry is predicted to be worth $30 billion by 2020. We are all familiar with VR concepts for B2C as this form of audience engagement opens up many possibilities and new revenue streams. From ringside seats at gigs and sporting events to front rows at fashion shows, suddenly we are all able to have a piece of the action from the comfort of our living room. Charities are now able to attract new donors through virtual storytelling and can build empathy and connect emotionally by literally putting viewers into other people’s shoes and viewing the world through the eyes of another. 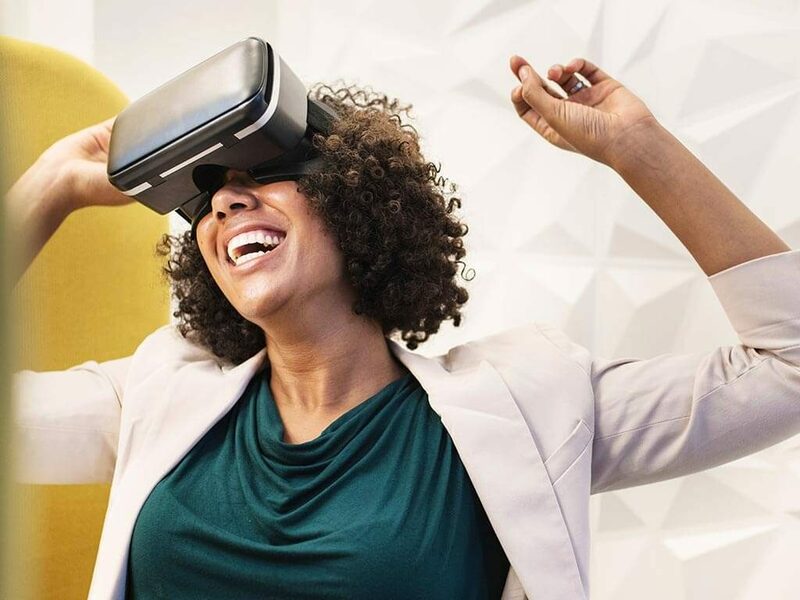 In business or education Virtual Reality can allow an individual to be placed in a chosen environment and have technical information communicated very quickly which makes for a tangible learning experience, saving time, minimising mistakes and maximising ROI. A VR journey wearing a headset can be truly inspiring. Messages can be conveyed in a fully immersive, highly entertaining and educational manner. However this makes it a lonely experience and the reach can be minimal. Now if we take the individual’s VR adventure – wherever that may be – and think outside the Google cardboard box, we could create another ‘voyeuristic experience’. An example of this could be a product demo of a wind turbine which at first doesn’t sound altogether exciting. Visualise the attendee, wearing a VR headset and absorbed in the world of the turbine. In their immersion, they are standing hundreds of feet up on the very top of the turbine. Each time they look down it makes them feel like they are experiencing the dizzying heights for real as the ground seems a long, long way down and the turbine’s rotating blades add to their imposed feeling of instability. The view from within their headset is projected onto several screens for those who pass by to see. Suddenly a fan is turned on and pointed in the headset wearer’s direction, some sound effects are added in and the attendees’ senses kick in and they start to wobble precariously. The audience that has now gathered in the aisles find it amusing to watch and are eager for their turn. So how do you engage the crowds when VR is built around one person? The answer is found by creating a spectacle and placing that individual ‘centre stage’. By allowing them to be the curator of his or her personal experience and projecting it for others to share, an immediate amplification and sense of drama is borne. This form of technology then becomes a valuable engagement tool for the event industry.